LG Electronics' 77-inch 4K OLED TV is shown in this undated handout from the company. A 77-inch television with a curved screen and resolution four times better than today's high-definition TV will be a centerpiece of LG Electronics' product line-up at next week's International CES in Las Vegas. The TV's screen is based on OLED (organic light emitting diode), a fundamentally different technology from LCD (liquid crystal display), the dominant flat-screen type in use today. Compared to LCDs, OLED panels produce pictures that appear brighter, crisper, more colorful and more vibrant to most people. The technology has been in commercial use for several years in smartphones, but display makers are still struggling to reliably produce OLED screens at screen sizes large enough for televisions. The difficulties in production mean many OLED products never reach the market or, if they do, remain prohibitively expensive for most consumers. The curved OLED televisions that will be on display at CES are not new. The Seoul-based company and cross-town rival Samsung Electronics both showed off curved TVs at August's IFA consumer electronics show in Berlin, but their appearance at CES will be the first time they are on show at a major U.S. exhibition. 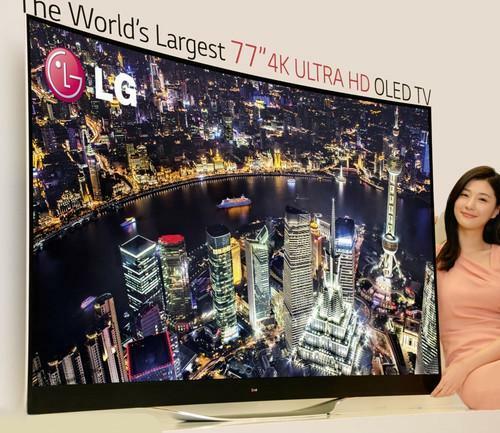 Alongside the 77-inch TV, LG said it will also show 65-inch and 55-inch models. The screens pack four times the number of pixels than a conventional high-definition TV screen. The resolution, at 3,840 pixels by 2,160 pixels, has been dubbed "4K" or "Ultra HD" by the consumer electronics industry. LG will also be showing OLED TVs that have conventional high-definition screens. To date, LG has only put one such TV on sale, a 55-inch HD model. It costs $10,000.